I am SO excited about the North Texas Teen Book Festival in Irving on April 23rd. I have been waiting for this day since I went last year and they announced they were going to do it again. I had a blast last year, and this year is going to be even better. Here are some of my prep steps. There is going to be 75 authors there, James Dashner, Marie Lu, Adi Alsaid,Jessica Brody, Ally Condie, and Gayle Foreman to name a few. Personally, I like to have read their books before I meet them if possible. I went through the list and found the books that appealed to me and started reading. I always enjoy panels a lot more if I know about the authors books. Check out the complete list of authors here. You can’t get your books signed by awesome people if you don’t have a copy of the book to have signed. Besides who doesn’t want an excuse to by more books? They will have books there to buy day of, but they don’t have every single book, and those books can go fast. You will have to buy a few books there because for every three books you bring from home, you have to buy one there. I think this is incredibly fair considering the fact that the festival is free to attend. 3.Make and prioritize a list of authors you want to meet. There are so many amazing authors there and the signing time isn’t going to last forever so make a list of who you want to meet according to priority. OR you could buy a Fast Pass. If you plan on buying a pass be sure to be there on time and ready to buy because they are available in limited quantities and will only be sold at the festival day of. They have two different options; a regular Fast Past gets you to the front of 10 signing lines and cost $100. A Super Fast Pass gets you to the front of 25 signing lines and cost $200. The good news is that they can be shared with your friends. These are new this year and I am super excited because last year some of those lines were crazy long! 4. Plan your day ahead of time. Go online and check out the panel schedule and choose which ones you want to go to. This will be hard because there are so many awesome panels, but it will make your day much easier. I recommend putting your first two choices on your list because there is the possibility that a panel will be full, and you don’t want to have to just jump into a random one do you? (I say that now, but last year the one panel I randomly jumped in to happened to be one of my favorites.) You can find the panel schedule here. 5. Buy a strong bag. Books are really heavy (as you know), so make sure whatever bag you take with you is ready for the job. My bag survived last year, but this year I am taking so many books with me that I’m afraid it’s not up to the job again. Some people take backpacks but I prefer a tote with a flat bottom so the books don’t get beat up. 6. Make a list of questions you want to ask at panels. Towards the end of each panel the take questions from the audience. If you have questions that you already know of, write them down so you don’t forget them at the last second. 7. Try to control your excitement. Then fail. Proceed by jumping up and down and reading like crazy because it’s THIS SATURDAY AND IT CAN’T GET HERE SOON ENOUGH! Get more information about the event on the Facebook page here and on the official website here. 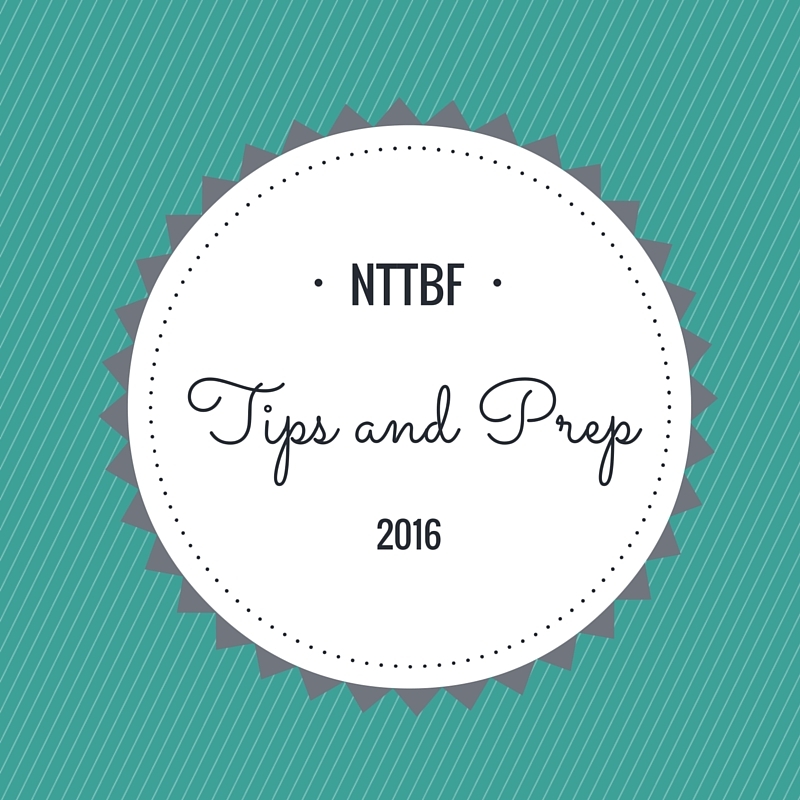 Also, keep an eye out for some more NTTBF themed post,I will be posting about my plans for the day and what I’m taking with me later this week.